Image Blinds have been manufacturing awnings for South East Queensland homes since 1986. Within the Straight Drop awning range Image Blinds boasts a large selection and have a style to suit your requirements and budget. Clear Poly Cafe Blinds with zips, Verandah Straight Drops with cord and pulleys, Straight Drops with gearboxes. Add the options of colorbond hoods and stainless steel dog clips creating a robust awning to withstand the harsh Queensland climate. Great for enclosing a patio or deck. Keep the sun off the house and lower the strain on your air conditioning. Operated by either a 7:1 gearbox, Cord or Somfy Motorisation for full control at the touch of a button. Image Blinds huge fabric range includes blockout European manufactured acrylic canvas’s and sunscreen material that offers a large range of colours and differing solar transmittance factors ranging from 10% to only 6%. All Image Blinds Awning material offers a manufacturers backed 5 year warranty. 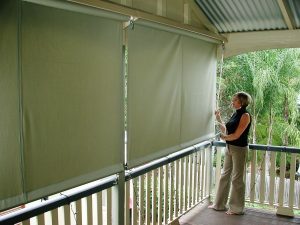 Protect your house from the harsh Queensland sun with a custom made roll up Image Blinds Awning today. Contact Us.